An adventurer at heart, I yearn to explore more of the cities, towns, natural wonders, and points of interest around wherever I happen to be living. For at least the past 12 months, I have wanted to visit the Biltmore, a sprawling estate just 50 miles over the state line in North Carolina. With the day off work, the sky nearly free of clouds, and the temperature a perfect 80 degrees, I road tripped last Thursday to the Biltmore and enjoyed a perfect day of fresh air, photography, and walking. 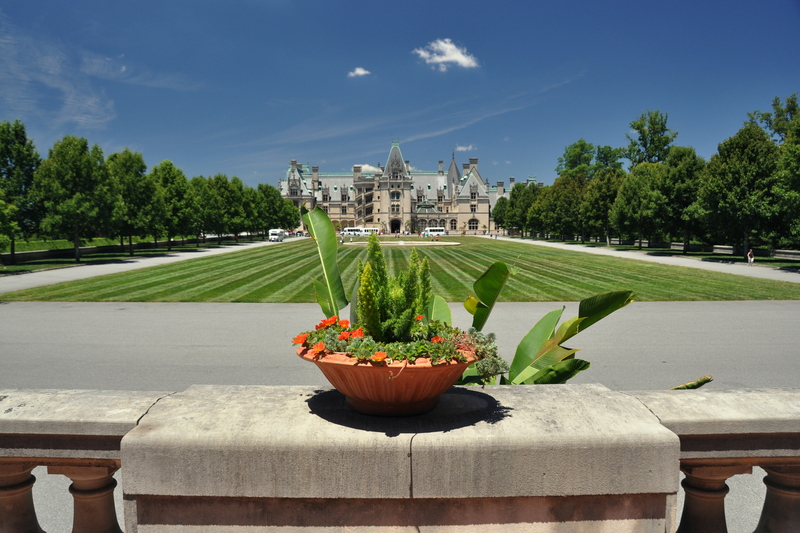 Art collector and horticulturalist George W. Vanderbilt, who inherited several million dollars from his shipping magnate parents, spent much of his fortune in 1895 after dreaming up plans for the colossal Biltmore House. Working with architect Richard Morris Hunt and landscaper Frederick Law Olmsted, Vanderbilt’s dream became a reality. The finished product: 250 rooms on 8,000 forested acres – the largest private estate in the U.S. If you were to picture the Hearst Castle, you wouldn’t be far off the mark. If you were to picture France’s Chambord Château, you’d be even closer. Notice the exterior spiral staircase, taken straight out of French château architecture books.